The following is an article by Jennifer Parker, and I just wanted to highlight this article here. We have come to a time at a crossroads in history, with a war raging on the other side of the world, to 9/11 and the collapse of the economy here at home. President Bush - the 43rd President of the United States, wants to be remembered for Liberating Iraqis and HIV / AIDS Work in Africa. But what will he really be known for..... One thing is for sure... He sure left allot of work for President-Elect Barack Obama to clean up ! ! ! ! ! President Says He Wants to Be Remembered for Liberating Iraqis and HIV / AIDS Work in Africa. In a personal and wide-ranging interview conducted by his sister about his legacy, his faith and the influence of his father, President George W. Bush said he hopes to be remembered as a liberator of the Iraqi people. 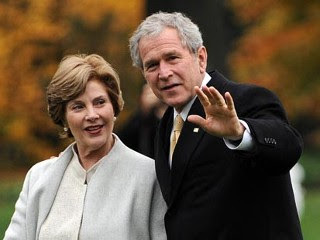 US President George W. Bush and First Lady Laura Bush arrive back at the White House after a trip to New York in Washington, DC, in this file photo. An excerpt of the interview was aired on National Public Radio Thursday, and the White House released additional excerpts with both the president and first lady Laura Bush today. "I would like to be a person remembered as a person who, first and foremost, did not sell his soul in order to accommodate the political process," Bush said, according to White House excerpts. What Do You Think BUSH will be remembered for? "I'd like to be a president [known] as somebody who liberated 50 million people and helped achieve peace,"
There were 2,974 fatalities, excluding the 19 hijackers: 246 on the four planes (from which there were no survivors), 2,603 in New York City in the towers and on the ground, and 125 at the Pentagon. An additional 24 people remain listed as missing. All of the fatalities in the attacks were civilians except for 55 military personnel killed at the Pentagon. More than 90 countries lost citizens in the attacks on the World Trade Center. In 2007, the New York City medical examiner's office added Felicia Dunn-Jones to the official death toll from the September 11 attacks. Dunn-Jones died five months after 9/11 from a lung condition which was linked to exposure to dust during the collapse of the World Trade Center. Where was the Central Intelligence Agency that actually was warned just prior to the attacks. This is like a sequel to another American disaster, the bombing of Pearl Harbor, as the warnings of the impending attacks fell on deaf ears. As if one disaster wasn't enough referring to 9/11, America was also witness to Hurricane Katrina, a natural disaster caused by no human, until President Bush put his signature on it by not responding in time to help the dieing and homeless in New Orleans. Do you think he will be remembered for that? When President Bush took office on January 20, 2001, the national average gas price was $1.46 per gallon. Six and a half years later, on August 27, 2007, the national average gas price had jumped to $2.76, roughly 89% higher. Eight years later, prior to the economic collapse, the price of gasoline was nearly $4.00 a gallon. The American people feel hostage to his policies and actions or the lack of during his presidency. Now, let’s compare the numbers over the same time period for President Clinton. When Clinton took office on January 20, 1993, the national average gas price was $1.06 per gallon. six and a half years later, the national average gas price had jumped to $1.22, roughly 15% higher. Compounded annually, this represents about a 2% jump each year. YES, I don't think that the American people will have a hard time remembering what President Bush was all about, they most certainly will never forget.